Whilst this is an expensive accessory, it does its job practically perfectly. It has a very nice design and overall I am extremely happy with this charger. If you can afford it, then definitely get this over a cheaper alternative, you won't be disappointed. As you should all now be aware, the G3 is the current flagship phone from LG. It was released in June and includes a 5.5 inch screen with what can only be described as the thinnest bezel on any android phone to date. Most of the variants include Wireless charging as standard, the unlucky few that don’t have one of these variants can buy a replacement case that includes wireless charging. So how do you go and use your G3 with its wireless charging? Just pick up any wireless charger? It might not be so simple, the G3 is highly picky about wireless chargers and if you use the wrong one you will get a very slow charge, or worse still, no charge at all! (but with the wake-locks still kicking in, so in effect it drains your battery instead of charging!!). But surely LG have a solution for this? 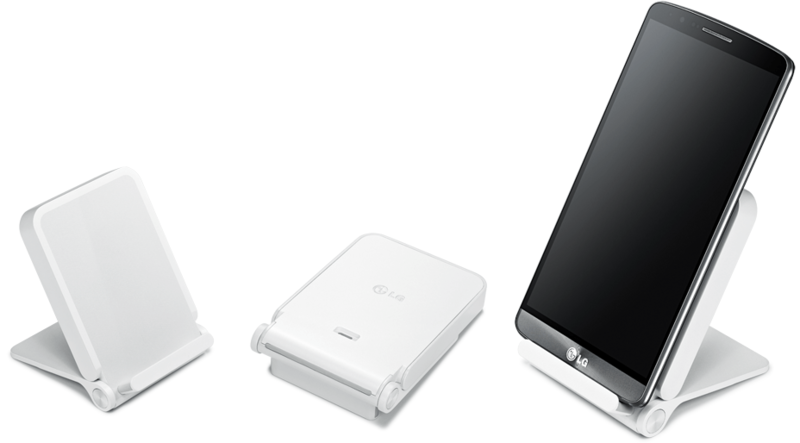 Yes, the LG Wireless Charger is here to save the day. The LG Wireless Charger is nice to look at, simple and effective. It folds flat when not in use and is a stand when in use. You can easily use the phone screen while charging, without issues (some other phones have sensitive screens whilst charging wireless, the G3 doesn’t appear to have this issue). Hopefully people know what to expect from wireless chargers, but if you don’t, expect a lot of plastic. Plastic, plastic everywhere! But this is not a bad thing, it makes the product super light weight for travel. Although it is plastic, and light weight it feels very solid at the same time, I don’t think it would break easily, even during transportation, which is great for charging on the move. The USB and Headphone port are both on the bottom of the G3 so you cannot access these while using the LG Wireless Charger. Likewise, the buttons are all on the back, so you will also be unable to access these (but that is not a huge issue as you can do everything from the touch screen anyway). The theory with wireless chargers is you just drop the phone on it and walk off knowing that it will be charging for you, when you want it back you just pick it up. However, as I eluded to at the start, the G3 is quite fussy about its chargers, in-fact most chargers I tried failed to establish a full speed connection, with the phone regularly beeping at me to move it to the hotspot (only it never found it!). The LG Wireless Charger went some way to fix this, in that it is possible to establish ha full connection, but you still need to be slightly careful with how you place the phone, it needs to be dead centre on the stand otherwise you only get a slow charge (and the aforementioned warnings…), after a little practice this is quite easy to achieve and is not a deal-breaker. What it does mean is that you will only get a slow or no charge at all if you use another (probably far cheaper) wireless charging alternative. And of course, it goes without saying (after-al it is 2014!) that it stops charging at 100% so you will not be overcharging your phone. If, like me, you use the LG Wireless Charger overnight you will be on 100% in the morning as it maintains a 100% level perfectly. It is worth noting that it might be fussy with the quality of USB cable you use with the product, it recommends you use the USB cable that you get with the G3, which, of course, works fine – but other cables might not give the same results. I don’t usually mention price in reviews, unless it is an important point, and in this case it definitely is. The LG Wireless Charger is not cheap! At £59.99 it is definitely one of the more expensive wireless chargers you can buy, but as I said above it may be the only charger (certainly the only one of about 10 different models I tried) that can give you a full speed charge. And for this reason, and this reason alone it is worth the money. Tylt Vu works great with the G3 and you can leave your case on. It looks like that’s not the case with this charger. I love it! It’s very sturdy. And you always hit the ‘sweetspot’ for optimal loading, unlike the flat wireless LG charger I also posses.